And it’s Friday and I’m tired. Been a long day. Did not sleep well. I repeat, Did not sleep well. My pillows did their best to make for an uneasy night of sleep and when I woke when Bill was kissing me goodbye, I couldn’t really go back to sleep since my shoulder was troubling me. It’s fine now, but at some point during the night the pillows decided to do whatever they wanted to do and what they wanted to do was make my sleep uncomfortable. They succeeded and I eventually surrendered the bed to them. I shuffled about, cold once again, but not as cold as it’s been. Today was in the 30 degree area so that made it somewhat warmer. Still it was cold as I waited for the bus into the city. I missed the 11:15 bus which I’ve been taking instead of avoiding since it’s been so damn cold outside. The 11:30 bus came rolling up in it’s own time and we rolled towards the tunnel. Once inside the tunnel we sat and waited for a few minutes, an absolute standstill. After that it was smooth sailing about one hundred yards into the bus terminal where I made my way down to the post office dropping off some Christmas cards and Shutter Island off to Netflix land. Shutter Island, a big ‘meh’. I was on time at the cigar shop and immediately went to work. I found out the computers crashed for about 3 hours yesterday, putting a major dent in holiday sales. Well we have some cheap, old computers that when the sales process is going slow, I remark to the customer, apologizing and saying that we bought the computers at the Soviet Union garage sale a few years back. That usually gets a chuckle. The day was topsy turvy. I couldn’t get a grip on some customers despite my trying to connect. Two times I would be working with customers who didn’t know what they wanted and as I tried to steer them to a product they might like they just didn’t get it. A co-worker nearby would see what was going on and essentially repeat whatever it was that I said and the co-worker would make the connection. I’d still get the sale but for some reason they would not hear what I was saying, but they would hear the Bradley or Sean. It was frustrating and I decided not to talk to any customers from there on in. I made it to the bus terminal from the cigar shop in 18 minutes, 10 seconds. Puffing on a cigar and listening to I Am the Walrus, Baby You’re a Rich Man, Flying, Dear Prudence and Revolution 1. Not my usual stomping, getting the hell out of my way music, but it was enjoyable regardless and I was able to catch the 10:30 bus. Sorry I did not take Harpy’s call as I was trying to close the store but I can’t afford any distractions in that last half hour of closing. 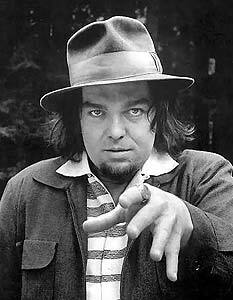 Harpy was the one who hipped me to the surprise news that Captain Beefheart aka Don Van Vliet passed away after a long battle with multiple sclerosis. Oh I might not write tomorrow since I am going to see Prince at Madison Square Garden. Sunday I will write. I promise I will. This entry was posted in Iron my Shirt and tagged Captain Beefheart, Cigar Shop, Harpy on December 17, 2010 by johnozed.